Rather than verifying shaky claims of slavery and then seeking out the source of this possible ill (say in the repressive environment the Saharawi people have endured since the illegal invasion by Moroccan forces in 1975, an event that sent many into the camps that still exist today), the filmmakers of Stolen chose to conflate a few ill-gotten and misunderstood accusations into a tabloid expose. The approach of the film-makers challenges the very basis of the documentary genre and undermines its value as a means of serious scrutiny. In an age when reality TV is nothing of the sort and when celebrity gossip is considered hard news, this is perhaps not surprising. But it is disappointing and very distressing for those who, like Fetim, are vilified in the process. There are fundamental flaws in the film-makers' storyboard. Fetim is not a slave and widespread slavery simply does not exist in the Saharawi refugee camps. This fact has been confirmed by numerous visits by independent journalists and human rights reporters over the years. A member of a delegation sent by Human Rights Watch to investigate the film-makers' claims said the delegation ‘‘did not find evidence of forced labour, certainly not of slavery of the kind’’ in 19th century America. The Saharawi live under great strain and considerable duress, brought about by decades of foreign occupation. A generation has grown up in a refugee environment. Our society is not perfect, our situation not Utopian. None is. But, slavery is something Polisario abhors and is on the record as opposing. The practice is an unacceptable cultural anachronism and we have outlawed it completely since the inception of our independence movement in 1973. Polisario has worked hard to address whatever human rights issues we find in our midst and we continue to undermine all forms of abuse and restrictions on liberty. This year, Polisario openly lobbied hard for the United Nations mandate to include a human rights monitoring process in its mission in Western Sahara. This was quashed by France, an erstwhile supporter of the Moroccan occupiers in Western Sahara, using its veto power in the Security Council. The biggest threat to human rights in Western Sahara is the illegal Moroccan occupation and the failure of the international system –- epitomised by France's blocking actions. These weaknesses ensure the Saharawi remain trapped in a nightmare of Realpolitik, driven to some extent by Morocco's vast propaganda machine. The simple desire, backed by UN resolutions, to allow the Saharawi the right to decide their fate (independence or autonomy under Moroccan administration) in a free and fair referendum remains, inexplicably, unrealised. Reality is clearly a fungible commodity in the eyes of the makers of this film, for its backers and for the festival organisers. They are reflective of a wider crisis in the ability to discern truth from fiction. They are not alone. There has been a negative impact on the life of Fetim Sallem by the actions of the film-makers and also on the cause of independence in Western Sahara. That’s a reality no one can challenge. June 21, 2009 -- Saharawi refugee and preschool teacher Fetim Sellami is a central character in the Australian-made documentary Stolen, a film set in the refugee camps in south-west Algeria that have been home to 165,000 Saharawi refugees since their country, Western Sahara, was invaded by Morocco in 1975. Stolen alleges that slavery is widespread in the camps and that Sellami and her family are slaves. She came to Australia to expose the film as a fraud. “The film-makers were surprised, but not happy, to see me because they knew I’d tell the truth”, she told Green Left Weekly. She said that the film’s co-directors, Violetta Ayala and Dan Fallshaw, had led her to believe they were making “a documentary on family separation, a film about the story of my [UN-facilitated] reunion with my mother, which would help the cause of Western Sahara, highlighting the suffering caused by the Moroccan occupation”. However, “on their second visit I began to realise they’d changed course. They started asking questions about slavery … I’m not sure whether they came up with the idea themselves or had external influence”. She sent a signed statement to the film-makers, withdrawing her consent to be featured in the documentary. The film-makers ignored her wishes, claiming she was being manipulated by the Saharawi independence movement, Polisario, which runs the camps. She then sent a video statement to Screen Australia, which funded the film a A$300,000 public grant. But again her statement was ignored. 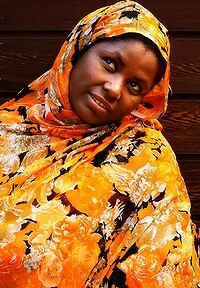 The true story of Sellami’s separation from her mother is typical of the Saharawi experience. She was three years old and at a neighbour’s house when the brutal Moroccan invasion occurred. Her mother was out of town and the neighbour, a woman called Deido, took Sellami with her when she fled the invaders, effectively becoming her foster mother. Deido left behind her own three-year-old daughter who happened to be with Deido’s mother at the time of the invasion. They claimed black Saharawi are held as slaves by their lighter-skinned compatriots who “made the decision to flee to the refugee camps in Algeria taking their slaves with them, separating the black families once again”. Ayala and Fallshaw’s cinematographer, Carlos Gonzalez disputed the allegations. “During the three weeks I spent there with them I saw absolutely no indication of slavery”, he told the 7.30 Report on June 15. He returned to the camps by himself and spoke to members of Sellami’s family who said they had been misquoted and mistranslated. Some black Saharawi men said the film-makers had paid them to say they were slaves on camera. She gave no explanation as to why slaves would want money to return to their cruel masters. She also denied dialogue in the film had been mistranslated. However, the 7.30 Report had sequences of the film translated by Al Jazeera television. In one scene, in which the film-makers’ subtitles show Sellami’s mother and sister confirming that she is a slave, the Al Jazeera translation shows that they were in fact discussing the film-makers’ misconceptions on the issue. How involved the Moroccan dictatorship was in making the film is unclear. However, Ayala and Fallshaw admit that some of the footage was transported in Moroccan diplomatic bags. The film’s co-directors, and producer Tom Zubrycki, accused the film’s critics — including Sellami, Mahfoud and Gonzalez — of being manipulated by Polisario. They imply Polisario is complicit in slavery. Sellami and Mahfoud’s real lives give credence to Polisario’s claim to have the best-run refugee camps in the world. Mahfoud studied electronic engineering in Cuba and now works in Madrid. One of their four children has studied in Spain. The family spend their holidays together, either in Spain or in the camps. Their level of international travel should dispel any notion that they are slaves. When Sellami and Mahfoud confronted Ayala and Fallshaw during the question-and-answer session at the premiere, they were jeered and heckled by the film-makers’ supporters.